It's a question that has persisted since the premiere of the awesome cult classic, The Adventures of Buckaroo Banzai: Across the Eighth Dimension. 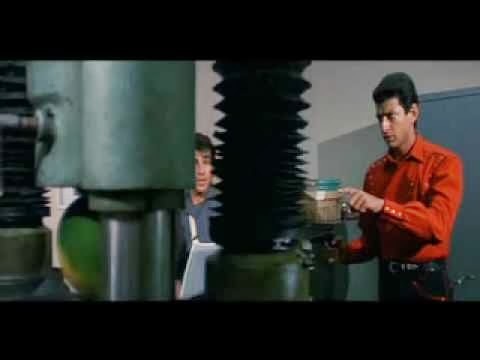 In the middle of a tense battle scene, when the aliens are prowling the complex, and Reno (Pepe Serna) and New Jersey (Jeff Goldblum) are sneaking through the labs, New Jersey points and famously asked, "What's that watermelon doing there?" Reno replies, "I'll tell you later." But he never does. Fans of the movie, and even the official Buckaroo Banzai website, have come up with all sorts of explanations for the watermelon. Here's the official explanation provided by W.D. Richter, director of Buckaroo Banzai, in the official newsletter on April 1986. Team Banzai botanical agronomists have been for years hard at work on the problem of hunger in Third World countries under constant revolutionary turmoil. A non-political, humanitarian effort, their goal has been to find ways to feed starving peoples in remote areas where traditional food delivery systems prove woefully inadequate. Often the only way to get the nourishment into the bellies of the needy is to hit and run, avoiding all petty ideological side-taking. What you see in the Critical Stress Lab is a revolutionary watermelon capable of withstanding impact pressures of 300,000 pounds per square inch! Sweet, juicy and vitamin-packed, this remarkable fruit can be dropped from the bomb bays of low-flying aircraft into the backyards of disenfranchised villagers in the remotest backwaters of this angry planet. Just another Team Banzai effort to cut through all the unnecessary crap around us and help people help themselves. Look for high-impact, low cholesterol eggs next... and sooner than you think, shatter-proof whole-wheat taco shells. That gives us the answer "in-universe," but the real reason behind the watermelon has nothing to do with Buckaroo Banzai or experiments or any of that stuff. It has to do with politics in Hollywood. You see, the production of Buckaroo Banzai was plagued with problems. The producer David Begelman fought with the film on every level, constantly sending notes and making changes. Then at one point, the notes stopped coming. The crew asked, "Is anyone watching us? Does anyone at the studio still care?" So they did an experiment. In the director's commentary for DVD, Richter explained that they went out to a street vendor, bought a watermelon, and stuck it in the machines. They shot the watermelon scene, and waited. Surely, such a bizarre moment that disrupted the whole flow of the action with no logical explanation would draw the attention of any studio crony that watched it. When they got no response, the crew knew that no one was paying attention, and they could do whatever they wanted. What did you think of the watermelon? I thought it might have some significance, like the oranges in the Godfather films. Disqus isn't working for me, so I'm glad this opened. How did I miss this movie? I'm going to see if it's on Amazon. Like Medeia, I'm not sure I've seen this one. Which seems wrong, considering I grew up in a movie theater! I love the watermelon story, though. I'd rather it had remained a mystery. But it is pretty funny.